These cunning european deer are smart and fast, making for challenging hunting. 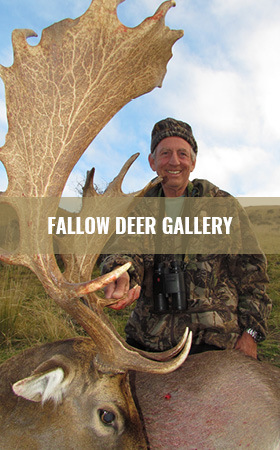 Palmated antlers and attractive markings make a handsome addition to any trophy room. Fallow arrived in New Zealand almost 150 years ago, to provide sport for early English gentry settlers. We offer both estate and free range hunts, with our hunting areas producing several “SCI Top 10” trophies in the past few years. Fallow are very variable in colour, with four main variants, "common" (brown), "menil" (grey), "melanistic" (chocolate) and "albinistic" (white). Fallow deer are the most aggressive of the deer species with males sometimes fighting till death during the rut. Fallow deer rut a little later than red deer, and become very vocal in April to May. They can be hunted from late February until end of August. Bucks become more visible during the rut and in the later part of the season.